BERLIN, GERMANY (THE GUARDIAN)--Berlin’s longest-standing African is 13 metres tall and carries in his bones the wisdom of 150m years. The skeleton of the Brachiosaurus brancai, the star of the city’s natural history museum, was dug up by a German paleontologist between 1909 and 1913 in Tanzania, then part of the German empire’s largest colony. 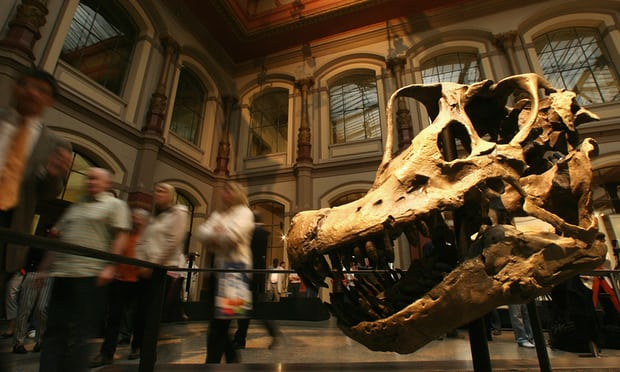 When the French president, Emmanuel Macron, announced last November that he wanted to use his presidency to lay the ground for “the temporary or permanent restitution of African patrimony to Africa”, many thought the time had come for the dinosaur to head back home. But, six months later, the Berlin Brachiosaurus is not moving an inch: a sign, activists and historians say, that Merkel’s government is failing to respond to Macron’s call with a similarly bold message, and that German museums are dragging their feet. New guidelines on the restitution of objects from “colonial contexts” were unveiled by the German culture minister, Monika Grütters, on Monday. She accepted the need to re-examine the provenance of objects amassed not just in the three decades in which Germany emulated other European states empire-building on the African continent, but during a colonial period defined as stretching back to the 15th-century conquistadores and into the present day. But while Germany’s first official definition of colonial contexts is surprisingly broad, critics say the bar for restitution claims has been set discouragingly high. The non-binding guidelines state that returning artefacts with a problematic history to their country of origin must not be a “compulsory solution”, and should be considered mainly for objects that violated the “legal and ethical standards” in the former colonies at the time. Activists have criticised the new document as a clear rejection of the French president’s initiative. “The guidelines are an attempt to preserve vested colonial interests that is doomed to failure”, said Tahir Della of the initiative for black people in Germany (ISD). Macron’s comments have focused public debate in Germany about the country’s “colonial blindspots” as Berlin prepares for the opening of the controversial Humboldt Forum in 2019, which will unite the city’s ethnographic and Asian art collections in a reconstruction of its Prussian-era palace. On Wednesday, Berlin’s Prussian cultural heritage foundation formally returned nine objects from the city’s collection to the Chugach Alaska Corporation, which represents indigenous peoples from south-western Alaska. A research project had revealed that the artefacts – including two broken masks, a child’s cradle, and a wooden idol – had been removed unlawfully from Alaskan native graves by the Norwegian ethnologist Johan Adrian Jacobsen in the 1880s. 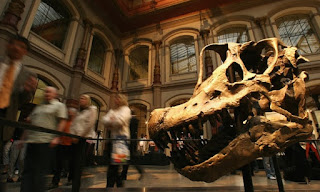 More prominent objects in Berlin’s collection, such as the Brachiosaurus brancai, however, are unlikely to be moved by the new restitution drive. The excavation of the colossus from Tanzania’s fossil-rich Tendaguru formation started in 1909, two years after colonial powers in German east Africa had squashed an armed uprising known as the Maji Maji rebellion, resulting in the deaths of 250,000–300,000 people from the local population. But a three-year research project into the conditions of the dig, funded by the German federal ministry for education and research to be published later this year, found that the Brachiosaurus’s bones were dug up under conditions of “fair” pay, without slave labour, said the natural history museum’s director, Johannes Vogel. Vogel told the Guardian that the dinosaur, the tallest mounted skeleton in the world, was not a cash cow for his museum but a live research object that was expensive to maintain. Earlier this month, Tanzania’s foreign minister, Augustine Mahiga, waived demands for the restitution of plundered cultural artefacts from the colonial period. Speaking at a meeting with the German foreign minister, Heiko Maas, in Dar es Salaam, Mahiga said the dinosaur “does not belong to Germany or Tanzania” but should be considered a piece of world heritage, and praised the museum’s treatment of the remains. “The German taxpayer pays a lot of money to preserve it,” he said. The Tanzanian government is a recipient of German development aid. Instead of restituting the skeleton to Tanzania, Vogel said, the museum was proposing a programme whereby Berlin would help train up Tanzanian palaeontologists and technical workers to explore the large uncharted sections of the Tendaguru formation.